SunPower® by Alternative Energy Systems serves the North Valley region of California, known for its hot summers and unpredictable winters. Despite the fact this part of the state typically enjoys mostly sunny days, you may want to know how solar systems respond to the rest of the region’s seasons. A common misconception involves the belief that winter weather makes it harder to collect energy with a solar energy system. In order to understand why this is not necessarily the case, here’s a short explanation as to how solar systems create useable electricity. Solar panels, also known as photovoltaic (PV) panels, convert sun energy to direct current (DC) energy. DC energy is then converted through an inverter (or microinverter) to alternate current (AC), the form of electricity used to power your house. 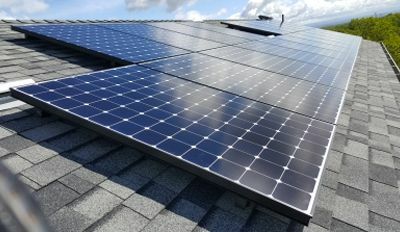 Solar energy is converted twice before reaching your appliances: once when the light energy from the sun is converted to DC in the panel, and then again when it passes through an inverter to become AC. During the energy conversion process, a percentage of energy is lost in the form of heat. 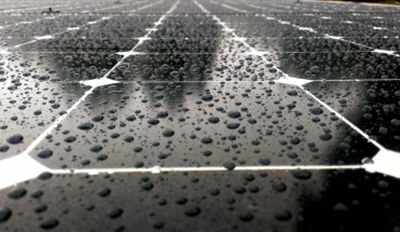 So when a PV panel is already hot, the process is less efficient as the panel is already saturated. But cool/cold winter temperatures facilitate better transfer of energy, which won’t put a damper on your PV’s ability to convert power. Seasonally improved energy conversion isn’t going to completely make up for the shorter duration of sun exposure, but cooler weather still benefits your bottom line. What about snow? Since your solar system will be oriented to capture the most sun throughout the day, any snow accumulation also receives that sun energy. This warms the PV panels, accelerating snowmelt, and speeding up the process of clearing your panels. If your install location receives snow regularly in the winter, the panels will be installed to provide the proper angle to ensure snow clears the surface area easily. Rainy days usually mean a reduction in power collected due to increased cloud cover. Still, wet weather plays a role in improving your system’s performance by helping rinse off the film and debris that collects on the panels naturally. To increase exposure, SunPower panels feature a thin coating of prisms on their surface to catch light rays coming from various directions, maximizing collection of energy even in lower light conditions. Times of drought will also impact your system’s ability to produce energy--and this is one of the rare positive impacts of reduced precipitation. During a drought, which Californians know too well, cloud cover is minimized. This results in higher collection of solar energy by a system year round, and during a drought year you may see your system performing more effectively than in other years. Solar systems are designed for year-round weather conditions, and now you know how some of the elements impact potential energy production. SunPower® solar panels last longer and degrade less than conventional ones, so you can save even more over time. Ask for SunPower.